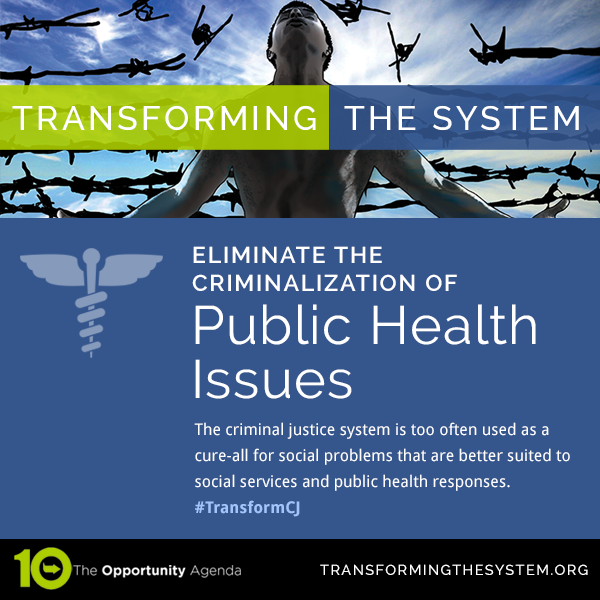 Individuals with physical and mental health concerns are especially vulnerable to increased criminalization. Poorly trained police staff may be ill-equipped to respond to individuals of various abilities and situations may unnecessarily escalate. They are also often targeted for their health status rather than for wrongdoing. During street encounters, police officers are almost twice as likely to arrest someone who appeared to have mental health issues for the same, usually minor infraction. Criminalizing individuals with mental health issues often creates a never-ending revolving door into the criminal justice system with many mental health issues never receiving appropriate care. The vast population of incarcerated people with mental health issues reflects a justice system that disproportionately arrests, mistreats, retains, and re-arrests them. Today there are three times more people with a serious mental health issues in jails and prisons than in hospitals. In every county in the United States, there are more people with serious mental health issues in the local jail than in the local treatment center. There are more people with mental health issues in Los Angeles County Jail, Chicago’s Cook County Jail, or New York’s Riker’s Island Jail respectively than in any psychiatric hospital in the United States. Fortunately, the Affordable Care Act provides an opportunity to ensure that people with mental health concerns are not criminalized when they should be treated for their illness. By investing in community mental health resources and appropriate diversions into treatment and away from the criminal justice system at every stage (i.e. 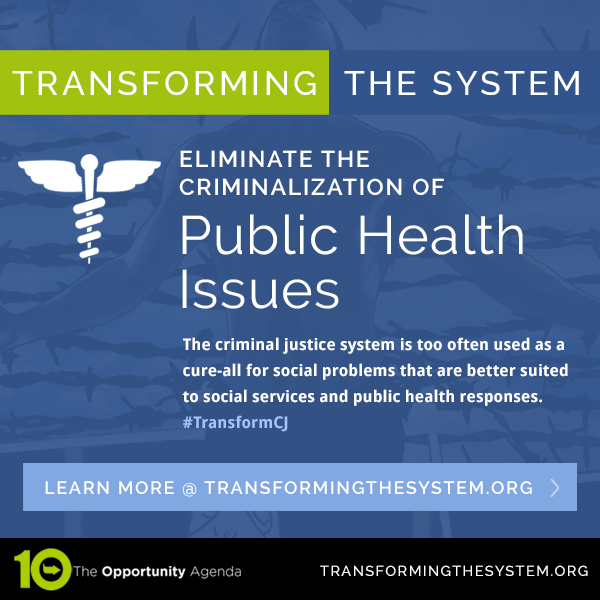 arrest, booking, adjudication, detention, re-entry), communities can give people with mental health issues the treatment they need, saving millions of dollars, and creating a healthier, safer, and more equitable society. Police should prioritize diverting people with mental health issues into treatment and away from the criminal justice system before they have been booked. Several police departments have implemented specialized police responses (SPRs), such as the Crisis Intervention Team, to change the way their officers interact with people with mental health issues. These programs partner with local mental health treatment centers to divert individuals with mental health issues into treatment. It is collaboration between law enforcement agencies, community groups, and public officials. People who are deaf and have other physical disabilities may also be subject to increased marginalization. Where avoiding arrest and incarceration is not an option, expands the use of specialty courts including, drug courts, DWI courts, mental health courts, and human trafficking intervention courts for persons who indicate that they are survivors of all kinds of human trafficking. These programs should only be adopted as part of a continuum of diversions where they have been proven to reduce incarceration and improve public safety by employing best practices; allowing for proper service provision; providing access to immigration attorneys where there might be immigration-related consequences; and allowing for independent oversight for the programs. Partnerships between law enforcement agencies, social service agencies, and civil society are formed to guarantee that people with disabilities, including individuals with mental health disabilities, are referred to social services agencies and civil society groups for appropriate services rather than criminalized, where appropriate.